April 15, 2015: Five centuries after the passing of Guru Nanak, his words still resonate with his followers. Let's take a look at 10 of his teachings that make sense to this day. 1. Never forget the poor. This mantra was relevant in 1500 when there was no concept of poverty alleviation, and is just as relevant now, when poverty hasn't left the world. When Nanak was 12, his father gave him Rs. 20 to set up a business. Nanak bought food worth Rs. 20 and gave it away. When his father asked him about this investment, Nanak told him it was a "true business". Today, a Gurudwara named Sacha Sauda (true business) exists, where Guru Nanak fed the poor. Using religion to segregate people into categories is awful. In the Guru's own words, "There is neither Hindu nor Muslim." On his visit to Hardiwar, he saw people offering the water of the Ganges towards the sun in the east, as an offering to their ancestors in heaven. He began to throw water towards the West. When others ridiculed him, he said: "If Ganges water will reach your ancestors in heaven, why should the water I throw not reach my fields in the Punjab, which are far less distant?" 3. Women are equal to men. At a time when other Indian religions wanted quiet, demure women in the temple and no women in the mosque, he permitted women to join religious gatherings and openly sing their praises of God. 4. Running away to a forest won’t give you enlightenment. Maybe one could achieve enlightenment in forests centuries ago, but we're not capable of that today. And Guru Nanak doesn’t even require you to do that. He believed that living as a householder was better than going away for a divine truth. Nanak himself was a farmer even after achieving enlightenment. 5. These five evils are probably ruining your life. a. Ego b. Anger c. Greed d. Attachment and e. Lust. Most, if not all, suffering of big city life comes from these five evils. 6. Find your own guru. You need a mentor to guide you on how to live right. In Guru Nanak’s words, living right is much superior to visiting pilgrimage destinations. 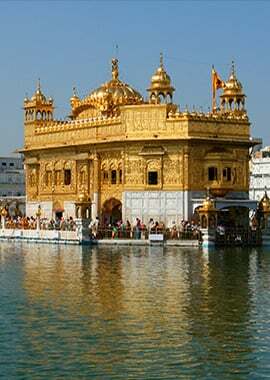 The Punjab Golden Temple feeds over a 100,000 people of all religions every single day. Not because there is some divine gain, but because it is a sacred duty. For Nanak, the concept of selfless service was a way of life. 8. Fight superstition of any kind. Nanak devoted his life to attacking formal rituals, caste, and practices that didn’t make any sense. This is the simplest way you can find meaning and purpose in your own life – cutting out the clutter of what society dictates you should do. It is not hard to practice the tenets of Sikhism. There are only 3! There is much to be gained from your journeys. At a time when religious leaders never ventured out of their villages, Guru Nanak walked, yes, walked, to Iraq, Ladakh, Tibet and Saudi Arabia!